In the past few years, surveys have indicated that Americans drive more than ever. According to NPR, the Federal Highway Administration released data that “drivers in cars, minivans, and SUVs put a record 3.22 trillion miles on the nation’s road last year, up 2.8 percent from 3.1 trillion miles in 2015” (February 2017). In 2013, the Brookings Institute reported that 90% of Americans drive to work. In the United States, 20% of people (approximately 48 million Americans) experience hearing loss. Approximately 60% of the US workforce experiences some degree of hearing loss. As the third most common medical condition in the United States, hearing loss is often undiagnosed and undertreated. 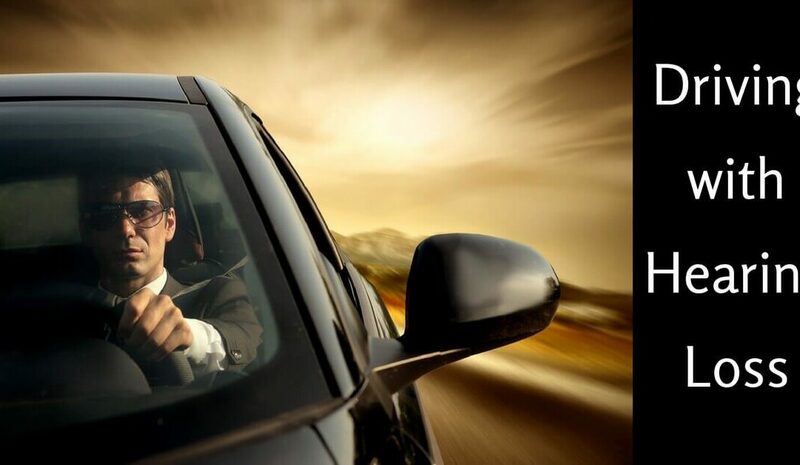 With numbers of drivers constantly rising, it is important to get your hearing tested. Treating hearing loss brings significant benefits to your overall health and well-being, and this includes safety on the road. Getting your hearing tested annually and treating your hearing loss are the two most important things you can do to drive safely with hearing loss. Make sure that your hearing aids are up to date and functioning optimally before you operate a vehicle. Hearing loss does not prevent people from driving, but it could hinder your abilities if combined with other physical issues. Below are some tips for driving with hearing loss. With hearing loss, even if treated with hearing aids, background noise could cause difficulties with focus, concentration, and catching the sounds you need to hear while on the road. While driving, make sure that you have any music or media turned down low. If there are other passengers in the car, ask them to keep conversation at a lower volume. Avoid using your phone while driving. Certain hearing aid models offer wireless streaming, which allows you to drive hands-free if you need to have a phone conversation in the car. All of our systems work in conjunction, and our vision is equally as important to driving as our hearing. Make sure that you take an annual vision test and use prescribed glasses or contact lenses. In terms of physical environment, make sure that all of your mirrors are accessible, and that your headlights are functioning properly while driving at night. If your vision is impaired, avoid driving in low-light or nighttime settings. Keep a good pair of sunglasses on hand and use visors strategically if driving against the sun. Reaction time encompasses the speed at which you drive and when you make decisions. You may make a decision in a split second that may be difficult to carry out if there are physical limitations, such as stiffness in joints from arthritis or other medical conditions. Seeking treatment for these physical conditions and adjusting your reaction time both ensure safer driving. If you are currently taking medication that makes you drowsy, try to avoid driving. AAA lists the most common conditions that affect safe driving as: impaired vision, physical limitations, dementia, diabetes, and sleep disorders. To ensure safe driving, consult with your doctor. If you are stopped by a law enforcement officer, it is important to communicate your hearing needs to them. Depending on your state, your hearing abilities may be listed on your license. To ensure your safety, as well as clear channels of communication with law enforcement officers, consider getting a visor card for your vehicle. Visor cards are laminated documents that are conveniently tucked into your visor. Storing them in your visor is preferable to keeping them in your glove compartment, as you are required to have two hands on the wheel when law enforcement officers approach your vehicle. Visor cards – available both for people who are culturally deaf and use ASL and people who experience hearing loss – communicate to the officer that you may not be able to hear or understand their orders and may require alternate communication strategies. Hearing loss affects people of all ages, and it is most prevalent amongst older Americans (age 65 and older). Hearing specialists recommend that we take hearing tests annually starting at the age of 50. Because hearing loss develops gradually and is an invisible condition, an annual hearing test will help you monitor your hearing abilities. If a hearing loss is found, your hearing health professional will recommend treatment tailored for your hearing loss. The most common treatment for hearing loss is the prescription of hearing aids. Hearing aids improve speech recognition, spatial awareness, and access to sounds in your environment – all of which are useful when it comes to driving.